Cream the butter and brown sugar together. Mix in the egg. In a separate bowl, mix the flour and cocoa powder together. Add the dry ingredients to the wet and combine. Scrape the cookie dough onto a piece of plastic wrap. Fold over the plastic wrap and refrigerate the dough for 30 minutes. Preheat the oven to 375°F. Take the dough, place it between two pieces of plastic wrap, and roll it out to 1/8-inch thick. Cut out 2 5/8-inch and 2 1/4-inch circles. Gather the scraps, roll them out to 1/8-inch, and continue cutting out circles until there are 24 2 5/8-inch circles and 24 2 1/4-inch circles. Take a 2 5/8-inch circle and place an unwrapped peanut butter cup on it (with the larger side down). Place a 2 1/4-inch circle of dough on top of the candy. Seal the smaller piece of dough to the larger one. Fold in three sides of the larger circle and pinch the three corners. Place on a parchment lined baking sheet. Repeat with the other dough circles. Chill the baking sheet in the fridge for 10 minutes. Once chilled, take the sheet out and use a knife to make a light "X" in the center of each side of the hat cookies. Bake for 10-12 minutes. Let cool on baking tray. They taste best when slightly warm and the chocolate is still a bit melted. Once cooled, they can be warmed up again for a couple of seconds in the microwave before serving, if desired. hey they're just like ravioli cookies! Your idea are so cute!!! I'm so happy you have a blog! Don't stop blogging, you are such a source of inspiration! Cathy: Now that I think about it, they are like ravioli cookies. Haha, I'll take the housewife comment as a compliment :P. Funny, cuz sometimes my mom comments that I think like a 30 year old... But, I do aspire to be one of those moms that makes cute bento boxes and treats for her kids someday (in the distant distant future). Faye: Thanks so much for the sweet comment. Being seen as creative is one of the highest compliments for me, so thank you :D! Mika: Thank you! I'm so glad you enjoy my blog :). mMmmMmMmM, like reeses! only shaped yummier~ YOM. ahhhh <33 now i'm totally craving some peanut butter cups! these look delicious! 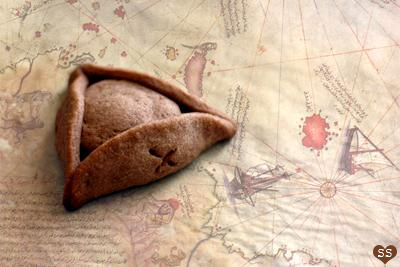 Wow, what a nice treasure to find inside these tricorne cookies! Very clever! So savvy! I'd eat these just because I'm totally and heartily in love with Captain Jack Sparrow. Steph: Thanks! Yeah, PB cups! Anonymous: Thank you for commenting; I love getting feedback on what ideas are appealing. I'm honored to be the first blog you've commented on :). Yay, Harry Potter Birthday Party! Sounds marvelous. If you want more HP ideas, yesterday I saw this while surfing the web: http://www.hostessblog.com/2010/04/harry-potter-party-birthday-ideas-part-1/ :D.
Mary: I know right? PB + Jack Sparrow, hehe. Sue: Yup, that's totally what I was going for cuz pirates always seem to be searching for treasure. Mags: Cute :). 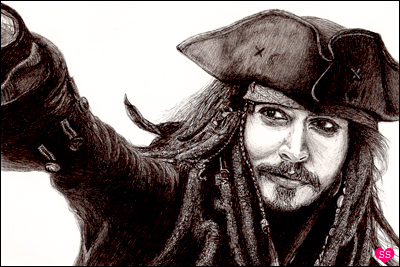 Jack Sparrow <3! YUM! Those are SO creative and look mighty delicious! I would love to try these! Pirate Soup, but yours blows it out of the water (no pun intended!!) LOL. Thanks for sharing! Can't wait to visit again! I just found your blog via the Apple Pie-rate Ships featured on One Pretty Thing. I LOVE your ideas! I have boys, so pirates, food, and video games (especially Mario Bros.) are quite possibly their three favorite things in life. 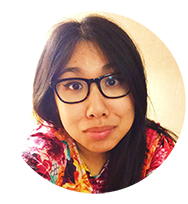 Do you mind if I mention you on my blog and post a link to the amazing projects on your site? So clever and easy- love the diagrams! Mary: Thanks, hope you do! Sophia: Yay, thanks! Pirate Soup actually sounds interesting; I've never heard of it before. Rachel: I'd be honored for you to mention my blog on your site. I'm glad you like it. Thanks for asking! Your creativity just blows me away. Between this and the ship I have GOT to have a pirate party soon! I'll be linking to this, thanks so much for the how-to. Mousewrites: Thank you. I hope you do make them. I tried out rollos as well. They were pretty good as well but they did end up smaller than the PB cup cookies so make sure to cut the dough circles smaller. Rachel: Thanks! Yay, I hope you do have a pirate party; it sounds awesome. Super cool! I am going to blog these. Thanks for sharing this with us! Kathryn: Thanks. Haha, okay :). I wish I had seen these before our Pirate murder mystery party! So cute!but I think with some tweaking they would work for Thanksgiving, too. I'm going to go search your site for some great ideas for our upcoming birthday party- How to train your Dragon style, lol. Bianca: A pirate party sounds super fun! Qtpies7: Whoa, Pirate murder mystery party, sounds intriguing. Like Clue pirate style? I can totally picture these being made on Thanksgiving. Oh, and a How to Train Your Dragon party also sounds awesome. Hmm, I must contemplate this idea for the near future :). Cassandra: Yay, sounds like it'll be a fun party! Jena: Sounds cool why just have ninjas when you can have pirates and ninjas? Like synergy of awesomeness. I totaly love your blog and the wonderful ideas on it!! Had a fun time doing it.. I also made some cowboy hats.. So funny, I thought these were hamantaschen. Boekwurm: Thank you! 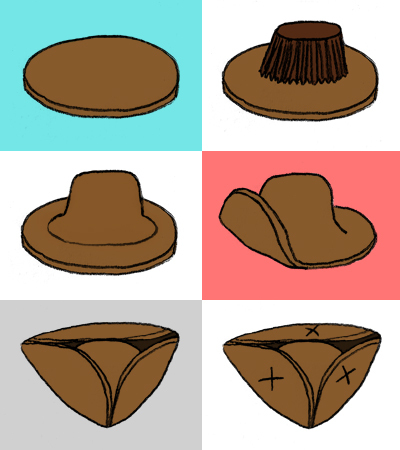 Cowboy hats. What a cool idea. Thanks for sharing! Laura: They do look like hamantaschen, don't they? Hehe. Hi, I'm a music teacher and we are performing a Pirate-themed musical and I love these for the cast party afterward. The only thing is that we have students with severe peanut allergies so I can't even bring them into the school. I saw an earlier blog that mentioned using rollos instead. Have you tried using anything else? Anonymous: Sorry for such a late reply! But yes, I have tried rollos instead and they work fine. The cookies just end up smaller since rollos have a smaller diameter than PB cups. 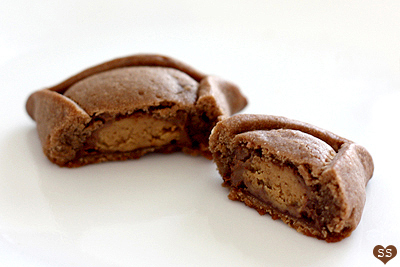 I think any chocolate candy that looks similar in shape to mini PB cups would work. Thanks for giving me the theme for the first birthday party of my son. Thanks and I promise to link your blog on mine with pics of the party to let you see what you'd contribute to do! V-ro: Pirate birthday party! Sounds so fun. This is awesome! Our City (Aberdeen, Washington)has a tall ship that was used in Pirates #1 (Endeavor, I think was the name) and was just informed that she is coming home to port next month. This would be ideal for a homecoming reception! Perfect timing. JP Creatables posted your link from FB. Just made these today with my daughter. Super fun! I'm pretty craft-impaired so my hats weren't very hat-like, until I got the idea to use a spatula to lift the edges. It kept the edges nice and rounded and the hats looked better. Thanks for this recipe, I can't wait to try out some others! 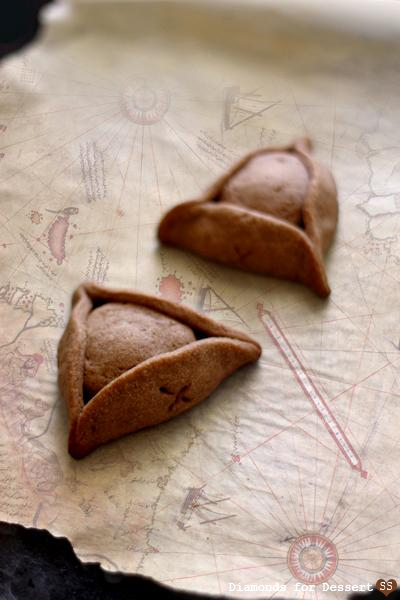 Would love to make these for Purim as my son is dressing up as a Pirate AND these sort of look like hamentashen! Do you have any ideas on what I can use instead of the peanut butter cups? Thanks! I made these today! I don't know what I did wrong, but my dough was so sticky I couldn't even handle it, it just stuck to everything. I couldn't even pick up the pieces I had cut out! I just had to keep adding more and more flour. I'm glad I did, because these cookies turned out DELICIOUS! They had a cornbread-y taste to them, coupled with the sweetness of the brown sugar. Also, I think my dough wasn't rolled out thin enough, because the cookies blew up super thick in the oven to where you couldn't tell they were tricornes. Next time, I think I will chill my dough for longer and see if that helps with the stickiness.